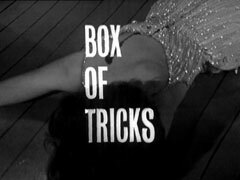 A nightclub conjuror Gerry Weston (Ian Curry) makes his assistant Valerie (Lynn Taylor) disappear from a box while the Dave Lee Trio provide a drum roll but when she reappears, she's been shot in the back. 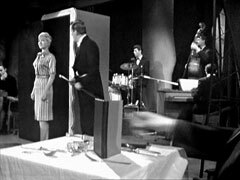 Venus sings "It's a pity to say good night" at the same club later on and waves when she sees the doorman (Gregory Scott) lead Steed to a table. Henriette (Jacqueline Jones), a hostess, intercepts the barman heading for Steed's table and delivers his brandy with a caress of his shoulders. She sits down and he orders her a drink then asks about the 'accident'. She tells him the girl was murdered - when she entered the cabinet someone was waiting with a gun; she's about to say something else when she notices the manager watching them and excuses herself, saying they're not allowed to talk about it. 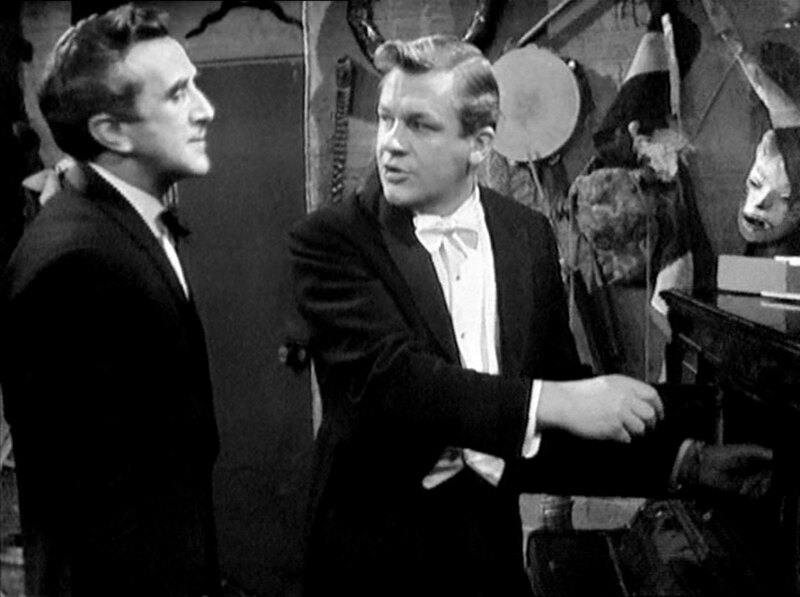 The manager (Dallas Cavell) approaches and tells Steed that "your client" - Venus - is a hit and he's thinking of extending the booking for "the evening star". He adds that business has been terrible since the girl's murder but the customers started coming again after Venus was booked. Venus joins them and the Major congratulates her before departing. Venus naïvely wonders how she got the gig, saying the Major received a 'phone call out of the blue and Steed tells her not to question fate. He claims he ran into her friend Kathleen, who was feeling a bit lonely as her father has just been given a NATO post. He suggests she visit her, then asks her about the club. She replies that the hostesses all talk about nothing but the murder; Valerie has been replaced by Denise. Venus thinks about the murder and concludes the killer used a silencer, and there ought to be a hole in the cabinet. 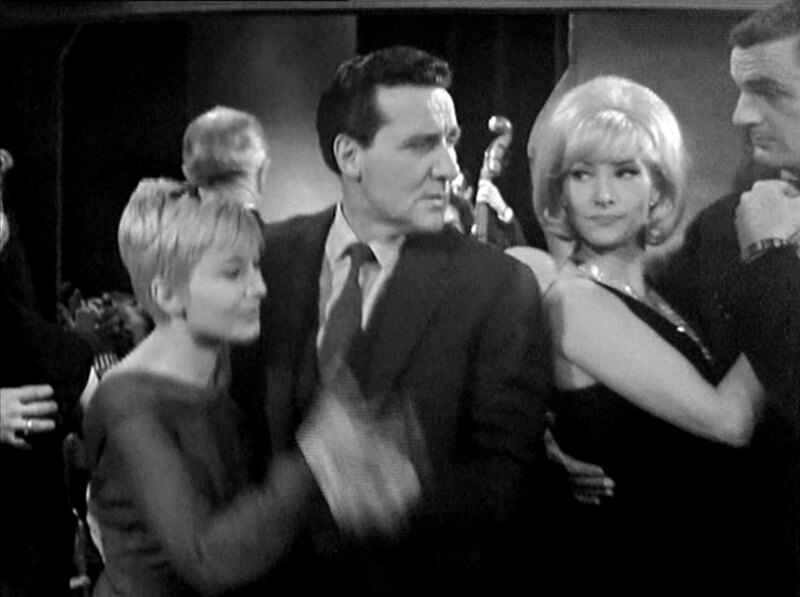 Steed spots Denise (April Olrich) in the club and asks the Major to introduce them. The barman, Nino (Robert Hartley), is told to give them a drink but when Denise discovers he's more interested in the cabinet she's furious and tells him to go and look at it himself - which he does! Venus has got there before him and is puzzling over a voice describing troop movements she can hear while inside it when he arrives. She explains to Steed there's a trap in the dance floor above and the cabinet drops down inside the case, but he's more interested when she mentions the overheard military orders. He hands her Kathy's address and leaves. General Sutherland (Maurice Hedley) wheels his chair into the hall and asks the maid, Mary, (Gail Starforth) to fetch him a brandy, then enters the parlour; as she leaves, Steed enters the apartment. His daughter Kathleen (Jane Barrett) tells him off for ordering a brandy at breakfast and he tells her it makes no difference - he's old and his back incurable. She begs him to see Dr Gallam, a faith healer who can transfer the pain and suffering to himself. Sutherland scoffs and forbids her to let him into the house, then wonders where his masseur has got to - Steed enters in a masseur's outfit and apologises for being late then wheels him off for treatment. Kathleen immediately calls Dr Gallam and asks him to come again to see her father, who is currently asking Steed what he thinks of faith healers. Steed's non-committal and says it's often just as good to talk about things, then drops a hint about being at NATO headquarters. The General abruptly ends the session early and tells him if there is privilege of information, it doesn't extend to him. Steed is obsequious and accepts an offer to join the General for tea when he spots Venus in the hall and excuses himself, saying he doesn't want to miss his 'bus. The General is introduced to Venus and goes to work in the study while the girls catch up. Venus hears him bark, "Got that?" and realises it's his voice she heard in the cabinet. Denise visits Weston who's make some props, and threatens to tell the police how he really felt about Valerie's death. He's about to slap her when they hear Venus in the next room. Venus innocently asks if Weston made the cabinet as well, then Denise hurriedly leads her back on stage for their rehearsal. She tells Venus that Gerry has his eye on Henriette and she will show him a lesson by not doing the act - but wants Venus to do it! Venus refuses, saying she won't go near the cabinet, so Denise shows her how to use it - she disappears, but doesn't come back. Venus is scared by a noise backstage, but finds Steed and he offers to have a look. They open the cabinet and Denise falls out, strangled with a stocking. Weston complains he knew he'd be suspected and blames Venus for saying he'd quarrelled with Denise, then hits upon the idea of getting her to do the act. She protests and the Major sternly tells Gerry she should decide, but she agrees to do it after a nod from Steed. Steed accompanies her back to her dressing room where she tells him it was the General's voice she heard. He tells her the General was nowhere near the club and asks her if she knows Gallam; she confirms that he treats some of the girls and is always hanging around with a 'magic box' which is supposed to contain healing elements - the patient carries it around with them. He asks her to introduce him, in the guise of a hypochondriac millionaire. Dr Gallam (Edgar Wreford) meanwhile visits Kathy and gives her a new box in exchange for the previous one, which she confirms he had near him at all times. Gallam is pleased and when she says the General is responding already, tells her he dreams of opening a clinic away from outside interference. The General wheels himself in angrily, saying, "not if I can help it" and barks at Kathy for disobeying him then orders Gallam to leave the house. Kathy confronts her father but he insists the man is a charlatan. Steed visits Dr Gallam, posing as the hypochondriac Thackeray. Gallam outlines the treatment via the sealed box of minerals and Steed is excited about a cure that doesn't involve 'exercise or diet or anything nauseating like that' but Gallam is reluctant to give him one. He asks for Steed's address and our hero is evasive, saying he only recently returned to England and is searching for an hotel without draughts or central heating. Venus arrives at the club early next morning and is given Steed's box by Harry, the porter, (Royston Tickner). Weston sees her with it and, not knowing what it is, she opens it and puzzles over the crystals, wires, tubes and sand inside. She rings Steed at the Sutherlands' and he tells her to keep it safe until he arrives. He passes Kathy asking Mary to post a letter in the hall and he offers to deliver it for her but she refuses, thinking he is opposed to Gallam treating her father. Gallam meanwhile visits Venus and tells her Thackeray is not an honest man and asks her if he told her he was a doctor, which she denies. He drapes a stocking around her neck and tells her to be careful, and to tell "Mr Steed" not to interfere again. Weston arrives just as she hides the magic box and hurries her off to get on stage. Meanwhile, Steed arrives and Venus joins his table, nervous about the cabinet, and tells him Gallam warned her off. Venus is then is asked to join Weston on stage and enter the cabinet. Gallam enters her dressing room meanwhile and steals the box; Steed is very much relieved to see her reappear unharmed and toasts her health before going to look at the box which Gallam has now hidden in the cabinet. Henriette leaves for a date with Gerry just as Venus discovers the theft, and she spots the box in the cabinet base as they leave, the central part having ascended to the stage. 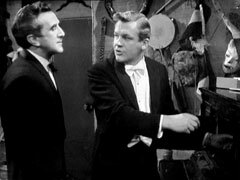 Steed cautiously prods it with his umbrella, and flicks it out seconds before the booby-trapped cabinet smashes down. He tells her that he'd noticed the wire and suspected the trap which Gallam had rigged it to get rid of him. Venus says the stakes must be high, then remembers Gallam refused to accept money and is puzzled. Kathy slips a new box in the carrier of her father's wheelchair then wheels him into his meeting with NATO officers in the parlour. She departs with the old box and takes it to Gallam, who asks how he is. She tells him her father is in another conference and her hurriedly tells her he hadn't fully recharged the box he gave her and will need it back that night - he'll supply another - and asks her to join him for dinner at the Gemini Club. The General meanwhile confronts Steed, saying he knows he's not a masseur and Steed tenders a letter of authority which explains why his identity had been kept secret from all ranks. The General assumes he's being relieved of his post because of Steed, but he tells him there's a security leak in the house and asks to interview Kathy, shocking the General. Kathy arrives at the club in time to hear Venus sing "It's de-lovely" and is join by Steed, who asks her if she'd believe Dr Gallam was a fraud if it could be proved. She reluctantly hands over the box when he says it affects her father's reputation then gasps when he opens the box and reveals a cassette recorder. Gallam enters and sees her telling Steed she's been putting the boxes in the General's chair. She's distressed at her folly and Steed tells her to take the box back home and lock it up. The magic act starts again and Gerry asks Kathy to be in the act instead of Venus; she protests but he's persuasive and she's led to the cabinet while Gallam heads downstairs. 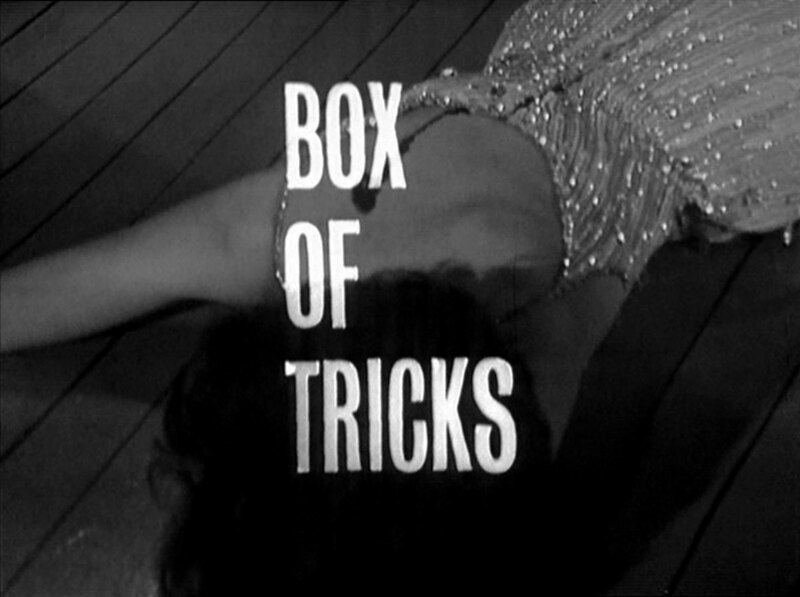 She confronts him and asks to speak and he leads her to Gerry's dressing room, where he takes the box from her and attaches the tape to a player concealed in an upright piano. Kathy tries to escape while he's busy but Gerry enters and brutally knocks her down. He takes over from Gallam, who's fumbling with the tape, and tells him it'll only take a moment to transmit the whole thing when Steed bursts in. He knocks down Gallam, then overpowers Gerry who's pulled a revolver on him, but Gallam recovers Gerry's revolver and holds him up. Gerry runs out then Gallam follows after retrieving the tape, locking the door behind him. Steed checks that Kathy is alright then tells her to stay where she is, as Gallam is armed; he then proceeds to break the lock on the door. Gallam meanwhile is hurrying through the basement corridors and takes a couple of shots at Steed, who provokes him into shooting a couple times, casually lighting a cigarette after inducing a sixth shot by tossing away the cigarette packet. Gallam approaches, gloating that Steed has no gun, and is easily knocked down by Steed when Kathy grabs him from behind. She apologises for being so silly and he says, "Never mind, the 'phone's in there." Over champagne and brandy, Venus and Steed discuss the case - until Steed has had enough and asks her to dance - but she keeps on chatting, annoying Henriette and the other dancers.